Of course, the baseball stadium isn't the only athletic facility getting some love. 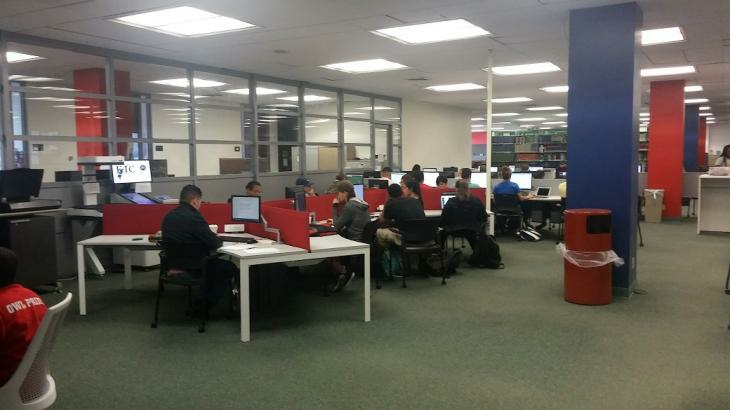 We've talked about this $800,000 project backed by donors (thank you all!) that's currently under construction south of the new sand volleyball courts/west of the track/north of The Burrow and construction is cruising. I expect this project to be done fairly quickly; the project was announced 7/16, started 8/16, expected finish 1/15/16. You can refresh your memory of the project with this UP article. 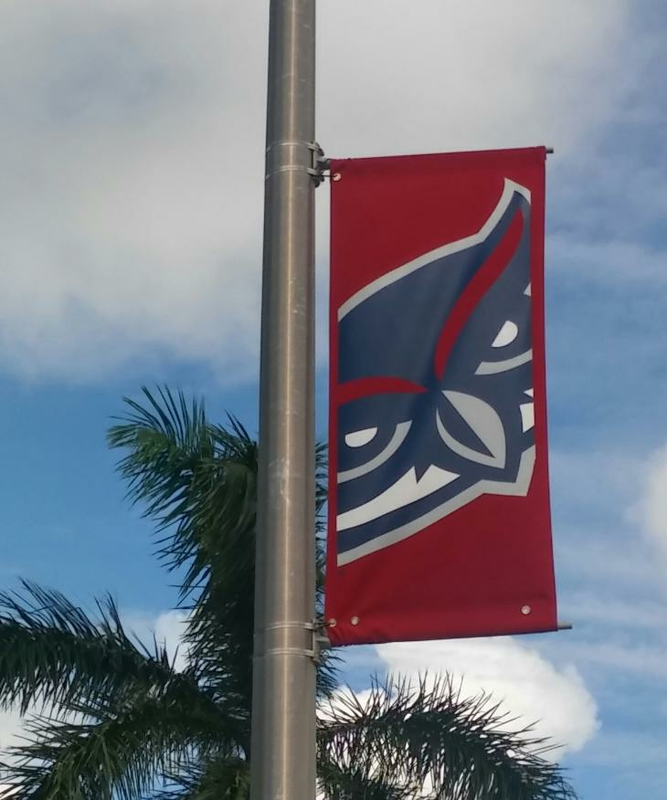 FAU has been installing 3 new banners on the major “university” roads around campus. 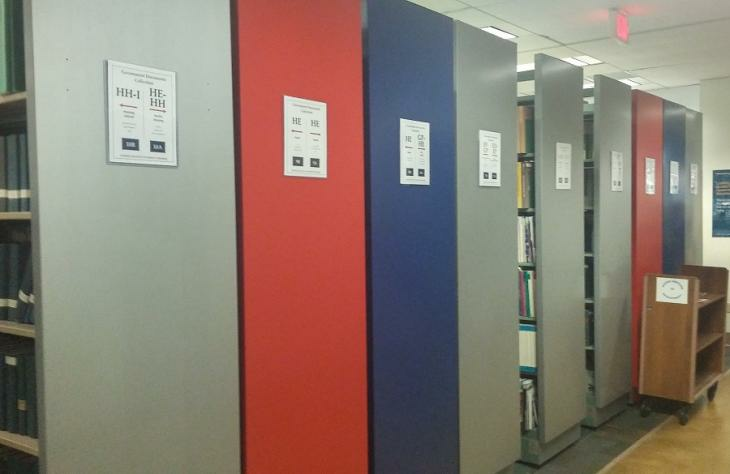 The new banners are more simple, bold direct designs. I dig it. 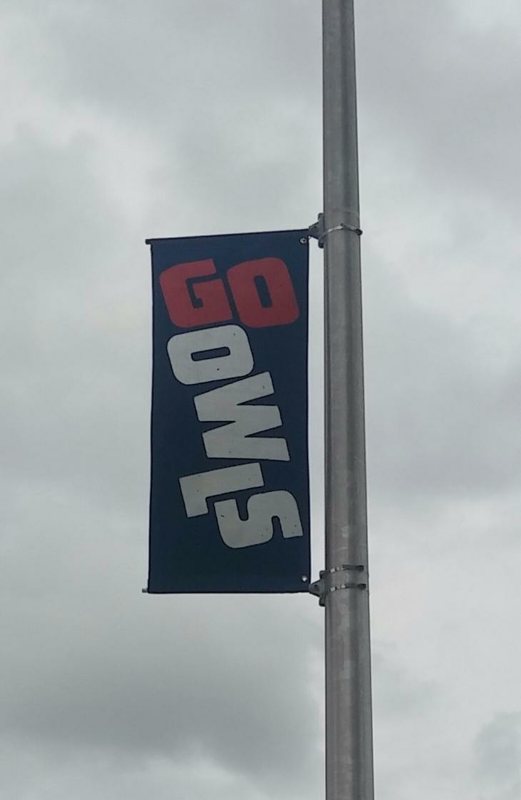 The GO OWLS banners are primarily along North University Blvd by the stadium. 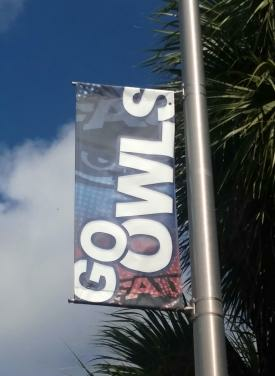 Unfortunately one lesson FAU still hasn't learned is purchasing the banners with wind flaps in them to minimize the damage done during heavy gusts that go up against this "wall" instead of having some holes to blow through. Oh well. one day. We’ve reported on this before but just a nugget from Sun Sentinel nothing that , “Construction is expected to start in October 2017 and be completed by December 2018.” So now we have a date. I wrote about the Student Union expansion back in September 2013 and you can see the space programming and overlay diagram to the site plan in that entry HERE. Final product should be similar; haven't seen any grand changes online anywhere. Yes! Finally! 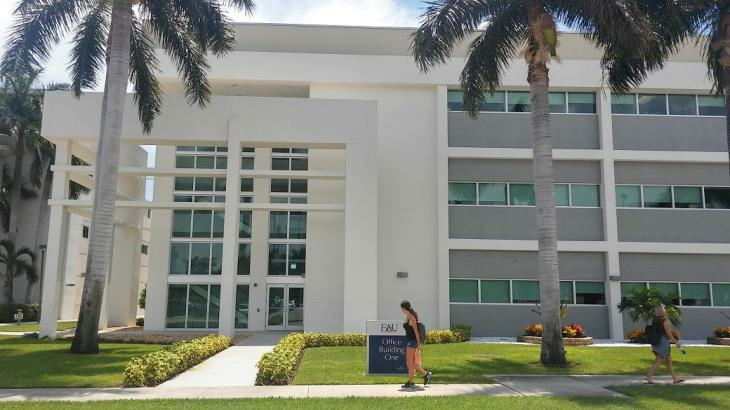 FAU is advertising for a new Boca Raton campus master plan (technically for all campuses, but we predominantly cover Boca on the blog here). 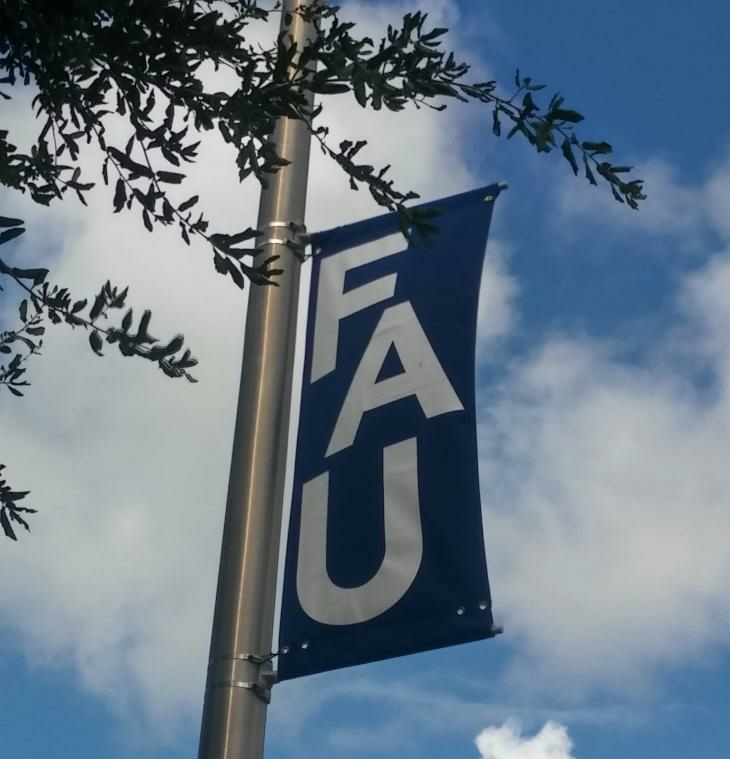 The advertisement doesn’t specifically mention any new buildings per se though a new Master Plan is kinda like a Christmas wishlist… you see everything FAU would LIKE to build, even if it doesn’t all come to fruition. You can see the previous (current) Master Plan HERE. That plan was from 2009, 7 years ago now, so you can see how much we aspired to and accomplished in that timeframe (about 15 projects by my count; 2, 4, 5, 9, 10, 12, 15, 17, 18, 19, 20, 21, 27, 40, 41, and possibly 7, 22, 30, 31, 35 as I’m not too familiar with that honestly). Obviously things change, new ideas and opportunities come up – like the new Athletic Center or Parliament Hall – that weren’t on here and take the space of something else. It will be interesting to see if a new basketball arena will be on this one (I’m sure it will be) as well as Greek Housing (was on previous Master Plan, fell off the 2009 plan), where the hotel will be exactly, where and how many future parking garages, if they plan to extend Diversity Way through the center of IVA like in the 20th Street Visioning Charrette on campus suggested, etc. 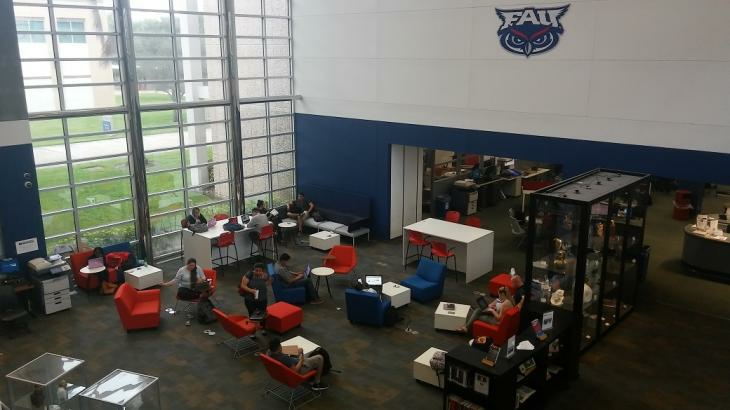 Since Kelly tends to be a bold thinker with big plans, I’m especially curious to see how he envisions FAU over the next 10 years or so covered by the new Master Plan. 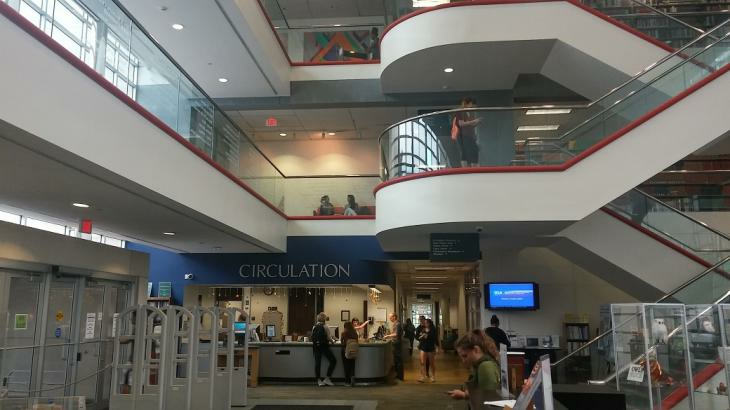 My understanding is there may be a charrette for it, much like there was for the Breezeway renovation, but I haven’t seen anything about that yet (if you do, please post in the forum and let us all know!). Barring that, if I have the time I may create my own version of the new Master Plan but we’ll see. This one isn’t exactly new but the “Developmental Research School” on the east side of campus may be getting a substantial facelift/new campus. You can read more HERE. 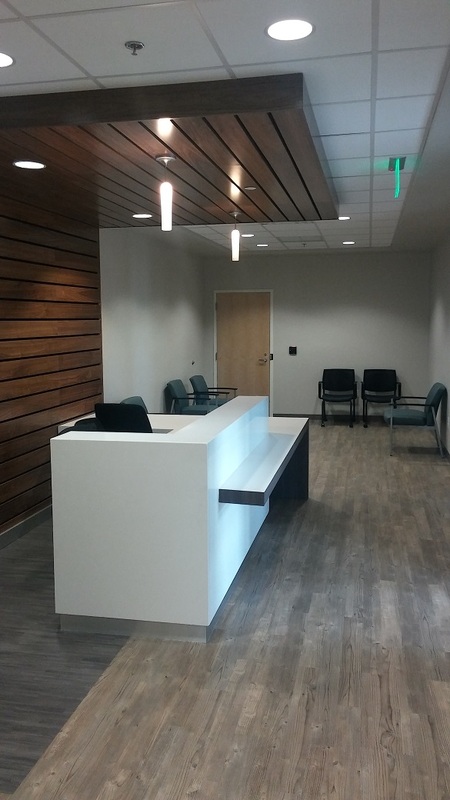 Forgot to post these before but randomly caught a look inside the new medical school office building when the faculty and staff started moving in. Not everything was open but the facility has (I believe) offices to see patients, College of Medicine faculty offices, conference rooms and research facilities as well. Homecoming, also known as Owl Prowl (not advertised that way this year) or the abbreviated slang “hoco”, rises and falls based upon the talents and indefatigability of the Homecoming Director. There’s a template that’s been established with certain events that happen every year, e.g. extravaCANza, and if nothing else you can rate Homecoming by how well those events are produced and succeed. By that measure, this year’s Homecoming Director has succeeded. The Homecoming events hit all the marks with the exception of no Homecoming comedian (the UP wrote an article HERE explaining that budget cuts forced some movement on the Program Board calendar) and the continued absence of the time-hononed Timucua Pageant (apparently this is out of Homecoming’s purview and is instead a Housing event, so they’d be the ones who dropped the ball). In its place was a drag show that went off very well and when you consider that FAU uses Homecoming to show off its diversity and pride, this was a nice element that could appeal to the LGBTQ community here. Michael Sam, the first NFL draft of an openly-gay football player, also spoke. So two concerts (country singer Chase Bryant and rock/pop(?) Kesha & The Creepies) plus a guest speaker makes up for a lack of a comedian. Additionally, the Homecoming website was very well done, the theme was great and the decorations around campus were excellent. It's evident that Homecoming Director Shannon Fahnestock and her crew put a good amount of time, thought and effort into making this a great Homecoming and sets the bar high for the next Homecoming Director. However, the main problem with Homecoming (a perpetual issue, not Shannon's doing) is that alumni by and large don’t “come home” for it. A recent poll on the forum and another on Twitter yielded low feedback but what I gathered reinforced the idea that alumni don’t attend a lot of events except the Talon Awards and the football game on an annual basis. You could argue that alumni won’t come out for things like extravaCANza – not worth the drive – but even the events that they could enjoy, like the Fall Family Fest on Friday night, is mostly students instead of families despite the programming always being for the latter. 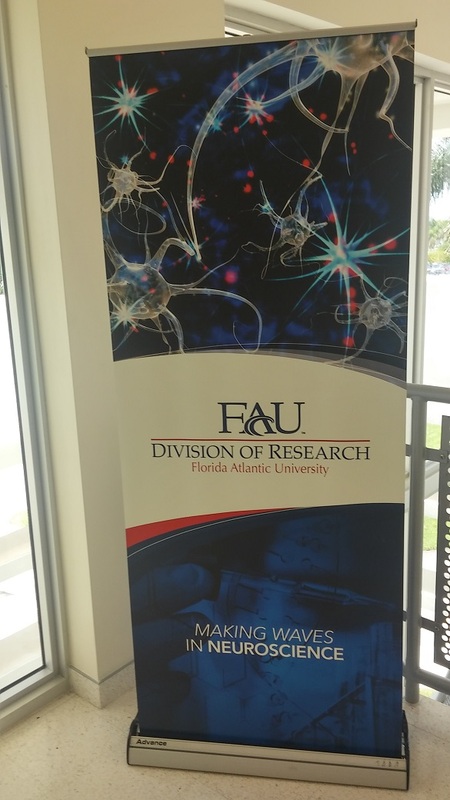 Why is it that FAU has over 100,000 alumni in the tri-county area and they don’t even show up for stuff like this? Are they not invited? 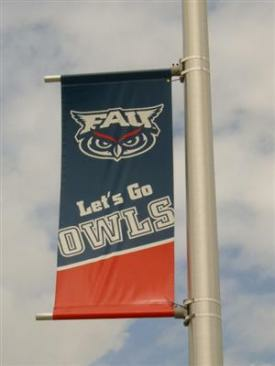 Or are they invited indirectly by FAU posting the events on the Homecoming page and expecting interested alumni to seek out that information? I understand the argument that the onus is upon the alumni to seek out information about Homecoming if they want to visit Homecoming. Sure, but every successful organization in the world markets to its core audience instead of putting stuff on their website and waiting for their customers to find it. And even when they do seek it out, they have to make a judgment call: do I drive an hour (let's say you live in Broward) for an event, or do I spend a thousand dollars to fly from say Chicago back to Boca for a few days (hotel, car, food, etc) and if I do, what's available for me to do? The reason this is important is because we have low alumni engagement and consequently fewer donations back to the university. The Alumni Association has an events calendar HERE and for the entire week of Homecoming the only event on the calendar is Party fOWL for the football game. Maybe this calendar is an afterthought, like some of the SG minutes webpages, or maybe they don’t post events they aren’t sponsoring (I could see that being the case). But even on their main webpage they didn’t announce it’s Homecoming week (why?) and it’s not on their True Blue News webpage either. It just doesn’t make any sense to me that Homecoming, which is an alumni event at any university across the country, is not even mentioned on our Alumni page? Shouldn’t Homecoming be a major event for the Alumni Association? And maybe all of this has been tried before and failed. Maybe they want to do it but don't have the budget or the manpower. I honestly don't know. But as an alumnus myself, especially if I lived far away, the main thing I'd want to experience if I spent a lot of time and money to "come home" for "Homecoming" is to reconnect to that feeling of being a student, of taking ownership of the campus, of being back in college again with "my people." That doesn't happen if you feel like a 30/40/50 year old weirdo walking around on campus uninvited and wondering what you could attend that would make you reconnect with the campus instead of feeling like yeah, that was a time in your life that was great but now it's gone and you don't have to think about it anymore... because that's how it feels now. I believe we can do better. I hope we do.